When we’re starting out, we want to know the best tools to use. What platform should I build my website on? What’s the best tool for writing? What should I use to create images for my site? What social media platforms should I invest time in? These thoughts can swirl around and around and keep us firmly planted in analysis paralysis. Don’t get me wrong: It makes sense to look for solid tools from the very beginning. You want to get your business off to a good start. You want to build it on a reliable platform and avoid having to make a painful switch to a different platform later. But you have to move on from that stage. Don’t dawdle there. 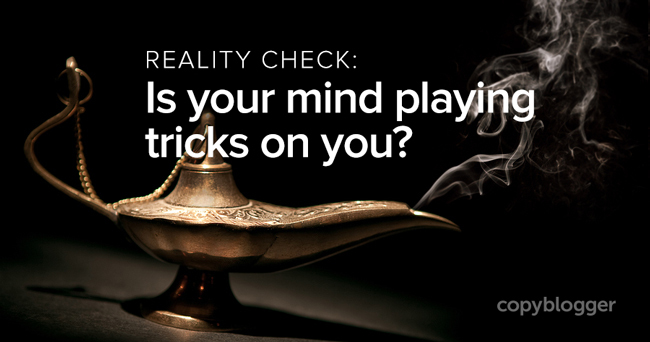 Sometimes your singular focus on finding the right tool is actually your mind playing tricks on you. Because as long as you’re researching tools, you’re “doing” something, right? You feel busy and productive. But here’s the thing: some of the most talented content marketers I know use some of the simplest tools out there. They’re rocking their stripped-down word processors, using simple online image editors, and taking full advantage of other freely available resources. And yet, they achieve extraordinary results. Their writing is in-depth, thought-provoking, and makes an impact. Their podcasts are crystal clear and compelling. Their images stop people in their tracks. It’s not about the tool you use. It’s about what you do with that tool. For example, my blog posts are most often written using a combination of inexpensive mind mapping software — where I organize my thoughts — and a simple text editor, where I flesh them out. Demian Farnworth uses Microsoft Word, believe it or not, to write those epic posts we all know and love. Rainmaker.FM podcasts are recorded primarily via GarageBand, which is a $4.99 app store purchase on a Mac. Audacity, an equally powerful audio editor, is free. Podcast interviews are conducted via Skype, which is also free. I realize this may sound strange coming from a company that sells state-of-the-art tools, but it’s not about the tools. It’s about what you bring to the tools. Be clear in your intent. Move forward with an attitude of discovery. Participate more than plan. That’s the path to mastery — not the tools you use to get there. When someone does brilliant work, do you notice people don’t focus on the tools they used? The final product in all its glory is what you focus on. The final result — not the tool — is what makes an impact. In the end, the most important thing is not the tool you use, but you. That’s why money you spend educating yourself will always be money well spent. Over time, there’s a really good chance that your tools will evolve as you evolve. You’ll start with one then, as your needs change, you’ll move on to a different one. My recommendation when you’re starting out is to aim for simplicity: don’t overspend on your tools at first. In the beginning, start simple. It’s as difficult to know in advance what tool will work best as it is to know in advance how your business will evolve. Add to your toolbox over time once you know what you really need. Experiment with free or low-cost tools. For content creation (writing, recording audio, and creating images), aim to use free or low-cost tools. Experiment with the type of content you can create with them. Work within their limitations. Search for advanced tools only when you feel restricted by your current tools. When you feel their limitations are holding you back from the content you’d like to create, then (and only then), begin your search for a new tool. Simple, inexpensive tools have another advantage: they tend to be easier to learn, too. Shorter learning curves mean faster content creation. For example, if you’re creating blog post images, you’ll have a much easier time learning to use Canva or PicMonkey than you will Photoshop. Sure, Photoshop does more, but for most of the images you’d want to create, it’s overkill. It’s like buying an über expensive Viking stove to make a dish of scrambled eggs. You’ll spend more time figuring out how to turn it on and adjust the heat than it takes for the eggs to cook! Simple tools, on the other hand, allow you to get up to speed quickly. You’ll go from choosing your tool to creating your content in no time. As our businesses change and grow, our tools should change with us. That’s why the “magical” tool that will solve all your problems is a dangerous myth. Don’t waste time pursuing the perfect tool for the job. Do your research, make an educated guess, and put the tools you choose to work: that’s where your content masterpiece will begin to take shape. Next article: When Do You Abandon the Editing Process?